Characterization of the thermal performance of thermal interface materials (TIM) used in electronics packaging can be critical to maintaining reliable performance, especially with the rapidly increasing heat dissipation requirements of each new generation of electronic components. 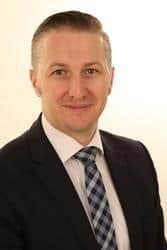 A wide variety of materials are available, typically to reduce the thermal resistance of the joint between a heat-generating component and its heat sink. Materials include greases, tapes, filled elastomer pads and phase-change materials. Get in contact with our laboratory for TIM-Testing as a Service: Click here to get more information about our laboratory-services. An often used technique for thermal conductivity testing is the absolute steady-state technology with a guarded-hot-plate based on ASTM C177 or ISO 8302. 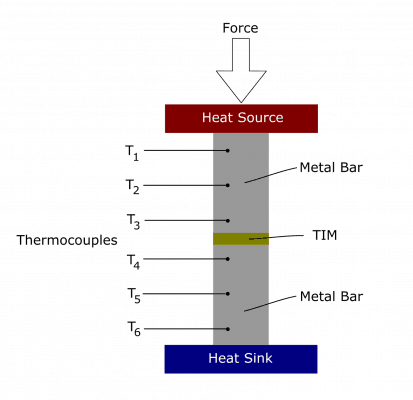 Within this method, a sample is heated by a heat-source with a known steady-state power input and the resulting temperature drop across a given length is measured via thermocouples. The challenge of this technology is to minimize parasitic heat losses to a very low level and overcome the influences of contact resistance between sample an metal bars. 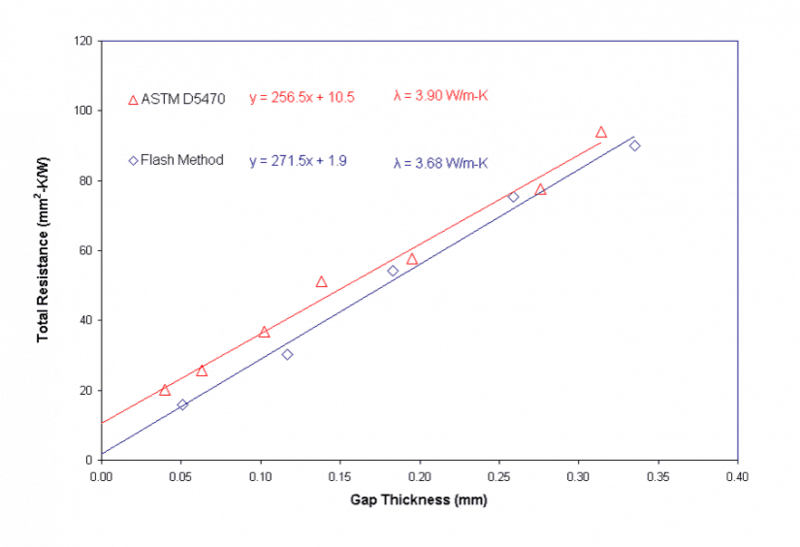 The steady-state method from ASTM C177 and ISO8302 is adapted for thermal interface materials in the standard ASTM D5470. This design measures the temperatures in the meter bars to determine the heat flux, and to extrapolate the temperature to the surface of the meter bar in contact with the specimen. The heat flux in the experiment is determined from the slope of this temperature gradient and a known conductivity of the meter bar material, copper alloy 110. 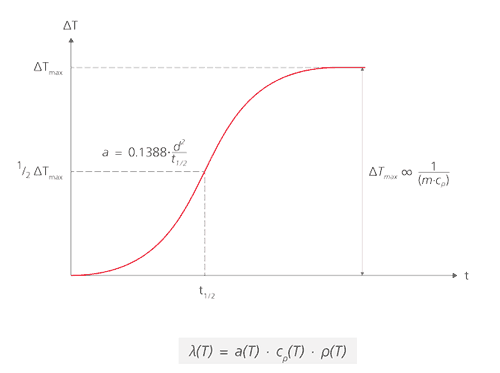 The surface temperature is obtained from the extrapolation of the plot of temperature vs. position to the zero position (or surface) of the meter bar. The flash diffusivity method (LFA) is commonly utilized to measure the thermal diffusivity and conductivity of a wide range of materials. 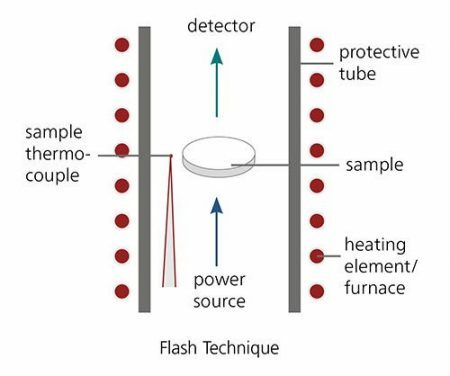 This transient method involves rapidly heating one surface of a sample with a single pulse from a laser or flash lamp and monitoring the arrival of the resulting temperature disturbance as a function of time on the opposite surface, usually with an IR detector. Remove the impact of contact resistance between the TIM and the metal bars from the measurement results. Measurements on a thermal grease and a TIM-Tape from 3M (8800) at different thicknesses are used for the calculation of the thermal conductivity from the slope of the thermal resistance plotted over thickness. The result are showing very similar results in slope (which is the true thermal conductivity). In the ASTM D5470 measurements you see an impact on contact resistance (Y-axxis-offset). 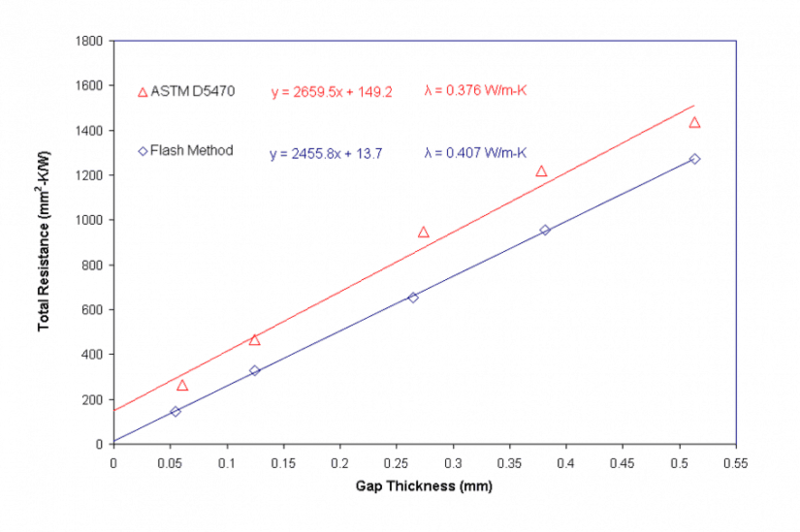 The obtained thermal conductivities from both methods are in good agreement as long as the results measured by ASTM C5470 are calculated with the knowledge about contact resistance, which can only be done with a series of measurements with a variation of the thickness.